Sophos Mail Security - Symtrex Inc.
Spam and other unwanted email bring risk and take valuable time of your employees. Using the Mail Filtering, all Spam and unwanted email is stopped before it gets delivered and clutters up mailboxes. Deflect damaging and malicious content at the gateway using dual, individual virus engines that operate in parallel. This allows content to be scanned and blocked before it has a chance to enter the network. Emails are far from private. Anyone between the sender and the receiver can intercept, read, and even copy or alter the contents. The Email Encryption packs, your messages secure and stamps them with a tamper-proof seal. The UserPortal is a self-management hub where employees can work with their email messages and previously configured remote access technologies without the help of an Administrator. 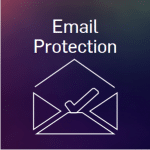 For more information, click here for Sophos Email Protection Datasheet, or contact us.